Stunning remodel - one-of-a-kind 3 bdrm 3 ba w/master suite & guest suite on GROUND LEVEL! Beautifully updated to today's decor throughout to include wood/stone flooring, newer paint, appliances including built-in wine cooler, lighting, countertops & the list goes on! 2 fireplaces(lvg rm & master bath)creates an ambiance w/the stylish decor. Spacious open floor plan makes entertaining easy. High ceilings w/lots of windows (plantations shutters) brings in the light! Generous downstairs master w/slider to patio. 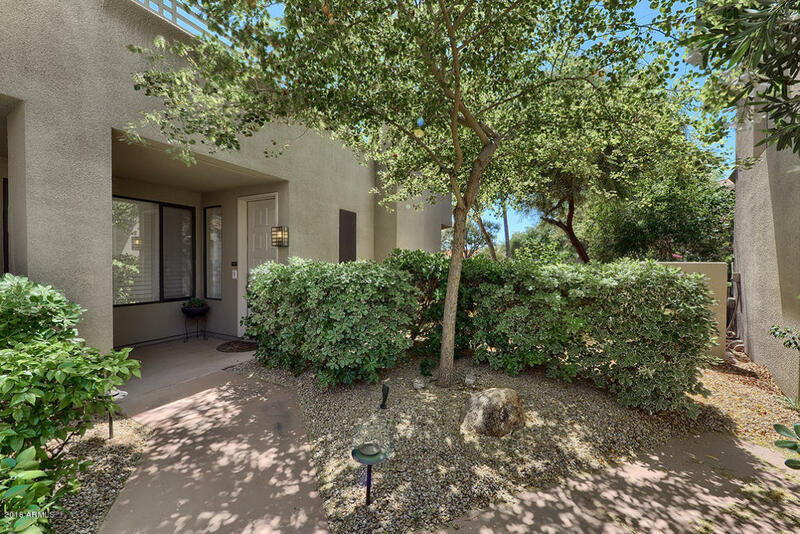 Glass walk-in shower, separate tub & granite w/huge walk-in closet in master. Guest rm down with updated bath on 1st level. Third guest suite upstairs w/private balcony. Lush inviting patio area. Club house pool/spa, 7 tennis courts, fitness center. DON'T MISS OUT...THIS IS A BEAUTY!